I’ve been trying to make some halfblind dovetail drawers out of prefinished Baltic Birch plywood. I just recently bought the porter cable 4212 to replace my crappy harbor freight jig which is impossible to setup correctly. the problem I’m seeing is that the min thickness is 1/2 inch and the plywood is slightly under. What I am finding is that when I set up jig, the setup isn’t deep enough to completely the pins. I end up with a flat spot on the pins because the router bit doesn’t quite touch the wood when I’m at the outside tips of the template. What i’m seeing is I get a lot of chip out on the pins. Any advice anyone has would be helpful. I assume you’re talking about the tails, not the pins. The flat spot won’t affect anything. All that’s important is that the tails fit snugly and flush in the pin board. As far as tear-out goes, use a backer board. The image below shows how it is used. Thanks for getting back to me. I’ve circled on the picture where I’m seeing issues. I set the template exactly on the line between the 2 pieces of wood, but because I am the router bit won’t touch the tip so it leaves a flat spot because the wood is a hair under 1/2 inch. I’m thinking if I used a higher degree bit it might cut into it? I did make a little progress with some test cuts last night, but I’m still having a little trouble on the depth that the tail so that it sinks perfectly flush since I’m using prefinished plywood. I was moving the brass adjustment nut to control that, but keep over and undershooting. I don’t know about the specifics of your bit set, but generally the half-blind bits are the same diameter top and bottom (1/2” and 1/4”), and the angle only varies due to the height of the cutter. At least this is true for my Leigh bits. When I built some drawers for the shop, I used up some old baltic birch that I’d had laying around for years. The summer heat in Tucson had done a number on the glue, and many of them chipped two or three plies off on the tips of the tails down to almost half of the thickness. They still glued up fine, look perfect, and are holding a lot of weight without a failure. I wouldn’t worry about having a slight flat spot there due to the thickness. It’s hidden down in the pin board. Getting the router bit depth set just right is a bear. I use a Porter Cable 7529 router which has incredibly precise depth control. I’ve also done them with fixed base routers where the depth is set by rotating the motor in the base and it’s a lesson in patience. 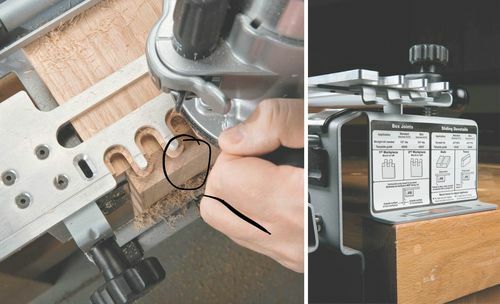 If you’re using one like that, keeping the router vertical on the base (not resting on the bit) will help because you eliminate the slack if the pin in the slot. If you’re using a plunge router, get some feeler gauges from an auto parts store and use them between the plunge stop and turret on the base for precise adjustment. Thanks for the feeler gauge recommendation. That sounds like a perfect solution for fine tuning the depth.